Home > Law Books > Treatises > International Trademark Dilution, 2019 ed. International Trademark Dilution, 2019 ed. International Trademark Dilution is an indispensable new resource for trademark attorneys and in-house counsel who need to protect their clients' trademarks across multiple global jurisdictions, and likewise is important for scholars engaged in research into the origins and development of dilution law. 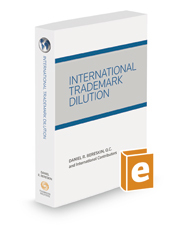 With 24 chapters authored by expert IP practitioners and academics, International Trademark Dilution provides analysis and explanation of the development, statutory implementation, and jurisprudential application of the concepts of unfair advantage, dilution, free riding, and tarnishment of trademarks. This book includes chapters devoted to dilution law in the United States and European Union, as well as Argentina, Australia, Brazil, Canada, Chile, China, India, Israel, Japan, Mexico, New Zealand, Russia, Singapore, South Africa, and Switzerland. In each jurisdictionally focused chapter, an IP expert of that country guides the reader through the process of qualifying a mark as “well-known” and obtaining protection for such well-known marks, using practical examples from that country's statutes and case law. In addition to the global focus on protection of well-known marks across a variety of jurisdictions, International Trademark Dilution also contains chapters devoted to explaining the use of survey evidence in U.S. dilution cases, and the intersection of freedom of speech / freedom of expression law with dilution protection. For example, Chapters 23 and 24 provide many useful illustrations of artistic and commercial expressions which, while potentially damaging a trademark, were protected in the European Union and/or the United States based on the fundamental freedom of expression.